IDIOT- 1. an utterly foolish or senseless person. 2. a fool, half-wit; imbecile; dolt, dun: New Sen. Brown bashes Obama's `bitter' health push. "An entire year has gone to waste. Millions of Americans have lost their jobs." New Sen. Brown bashes Obama's `bitter' health push. "An entire year has gone to waste. Millions of Americans have lost their jobs." 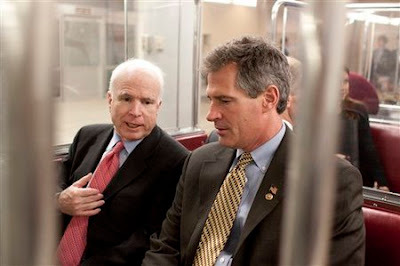 Newly arrived Republican Sen. Scott Brown of Massachusetts accused President Barack Obama and Democrats on Saturday of a "bitter, destructive and endless" drive to pass health overhaul legislation that Brown warned would be disastrous. "An entire year has gone to waste," Brown said in the weekly GOP radio and Internet address. "Millions of Americans have lost their jobs, and many more jobs are in danger. Even now, the president still hasn't gotten the message. "Somehow, the greater the public opposition to the health care bill, the more determined they seem to force it on us anyway." Brown himself can claim responsibility for the Democrats' failure to pass health overhaul legislation to date. They were on the verge of doing so before Brown claimed the late Edward M. Kennedy's Senate seat in a special election upset in January, depriving Democrats of their filibuster-proof supermajority and throwing the health care effort into limbo. It has been gradually revived, and Democrats are now pushing for final passage before Easter under complex Senate rules that would allow them to sidestep a Republican filibuster. Republicans in the House and Senate are unanimously opposed to the sweeping legislation, which would extend coverage to some 30 million uninsured Americans with a new mandate for nearly everyone to carry insurance. The House minority leader, Rep. John Boehner, R-Ohio, said in an interview for broadcast Sunday on CNN's "State of the Union" that if House Democrats had the votes to pass the health care bill they would have acted by now.